Will Paul George join the Lakers? Will LeBron win MVP? Will the 2018 NBA draft prove to be even better than the last? The Crossover examines the NBA questions that will shape 2018. The holiday season is behind us and we're about to hit the heart of the NBA's regular season. All-Star arguments are just a few weeks away. Surprise teams are fading, while superteams are stabilizing. The trade deadline is only a month away. Soon the playoff picture will come into focus in both conferences, contenders will add reinforcements, and before you know it we'll be watching games in May and June and wondering what's next in free agency. So while we've got a moment of relative calm before the second half of the season, let's celebrate the New Year by looking ahead. Here are 10 questions that will help shape the NBA in 2018. 1. Can OKC afford to keep Paul George? When the Thunder are at their best, they can push any team in the league. There have been a bunch of ugly nights along the way, but every time anyone begins to write them off, they'll go and throttle a team like the Rockets or Warriors to remind everyone it's not that simple. OKC is excellent on defense, the team has superstars to create offense out of thin air, and when the playoffs arrive and rotations are shortened, this is exactly the sort of team that becomes a miserable matchup for almost anyone. So even with Paul George's impending free agency, it seems like the smartest play for Sam Presti and the Thunder would be to keep George and see what happens. Presti would have almost no leverage in trade talks and probably wouldn't field much more than a low first–round pick and a rotation player. Why not roll the dice and hope OKC can win enough this spring to keep George this summer? Will George really sign away the next four years of his career to play on a 30-win Laker team with Lonzo Ball? It's not crazy to bet against it. The problem is that the rest of the roster complicates that calculus. Russell Westbrook is making $30+ million per year going forward, Carmelo Anthony is due $28 million next season, Steven Adams is due $24 million. Altogether, this makes next year's Thunder roster ... [punches calculator] ... extremely expensive. Have been told numerous times that OKC ownership is all in with a large tax bill next season. Luxury tax could be north of $140M. Even if everything goes well and the 50/50 bet on George's free agency pays off, the combination of luxury taxes and max salaries could cost $300 million—all to retain a nucleus that probably isn't good enough to beat the Warriors. That's why Paul George rumors are not just clickbait. 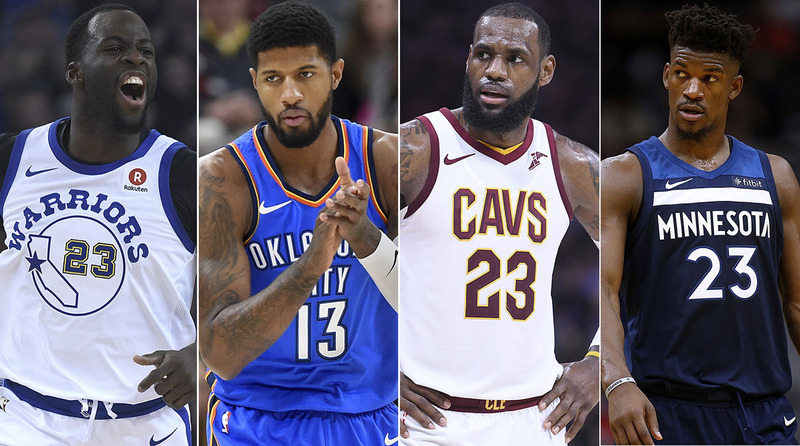 OKC is talented enough to scare anyone in the playoffs, but couple the threat of losing George for nothing with the enormous cost of trying to keep him, and it would be perfectly reasonable to listen to offers from... the Cavs? The Rockets? Maybe a dark horse like the Heat? The Lakers loading up before free agency next summer? I don't know. But this is the biggest wild card for the rest of the season, and the next month of tea leaf-reading will be fascinating. 2A. Can anyone take the MVP from LeBron? 2B. Can anyone take Rookie of the Year from Ben Simmons? LeBron is having another one those seasons that makes you wonder whether we're watching the greatest player to ever live. In Year 15, he's averaging 28.9 PPG, 9.2 APG, and 8.2 RPG on 55.9% from the field and 39% from three in 37.9 MPG. He's in the MVP conversation every year, but this year he's beginning to look like the clear frontrunner, in part because his competition is fading. James Harden was struggling for two weeks before the Rockets announced he'll miss the first half of January recovering from a hamstring injury. Russell Westbrook has been uneven in OKC, Steph Curry has been hurt for the Warriors, and Kevin Durant has been phenomenal, but his production will likely come back to earth now that Curry's back. That leaves LeBron, who allowed the Cavs to look horrendous for the first three weeks of the season before flattening the Wizards with 57 points on national TV and, from there, spending the next month carrying the Cavs right back to the top of the East. It's a compelling MVP case, particularly since LeBron seems due for at least one "Yeah, we probably should've been giving this to you every year" lifetime achievement MVP before he retires. He's probably winning it, and unless things change, there may not be much debate. Meanwhile, Ben Simmons—Training Wheels LeBron—has been incredible in Philly. For the first two months of the season it seemed like a foregone conclusion that he'd be Rookie of the Year. His numbers have begun to come back to earth over the past month—particularly in games that Joel Embiid misses—while rookies like Donovan Mitchell and Jayson Tatum continue to thrive. Simmons clearly has the highest ceiling of any rookie in the league, but if growing pains continue, we may get the inverse of the LeBron situation. There is more competition than expected, and there's just enough room for this to become a hellacious argument on the internet over the final few months of the season. 3. Which direction will the Wolves go? I can't tell whether the Wolves are actually good. Jimmy Butler is annihilating people and closing games by himself (good), they are on pace to win 50+ games for the first time since KG (great), and despite months of hand-wringing across the NBA internet Karl–Anthony Towns is still the second-best center in the West (good). But Jeff Teague is out indefinitely (bad), Tyus Jones and Jamal Crawford are the replacements (not ideal), Thibs is playing his starters like they're in the middle of seven–month playoff series (very bad), and ... I don't know. There are nights when the offense looks disjointed and the defense isn't good enough, and there have been a number of Wolves wins that are nonetheless shaky enough to make you concerned. But then, they keep winning, Butler is having another spectacular year, and if players like Wiggins and Towns progress, the Wolves could be lurking as the biggest dark horse in either conference. For now they are the best mystery in the NBA right now. Come watch them and get confused. 4. What will the Bucks do with Jabari Parker? How will Jabari Parker fit into the lineup when he returns, or will they trade him before we can find out? Given the contract he's likely to command and a potentially redundant fit next to Milwaukee's starters, Parker may not be worth the investment for the Bucks. There have already been rumors that the Bucks could try to move him in a deal for DeAndre Jordan. ... They could also try to package Parker and Tony Snell for elite role players like Rodney Hood and Joe Ingles from the Jazz. That deal would give Milwaukee more shooters around Giannis—probably a better fit than DeAndre Jordan—but it wouldn't be the sexiest return for a beloved former-No. 2 pick. ... And what if Jabari is more valuable than anyone they could find on the trade market, or anyone they could sign with his cap space? What if betting on his talent is still the best option for a Bucks team that needs one more star to give Giannis a real chance at a title? The Bucks will have to bet one way or another here. It should be really interesting, if only because of the stakes for one of the best young teams in the league. Look back at the list above. Everyone else that's available is coming from (at best) the middle of the league, likely on their way to a rebuild. The Bucks are still on the rise, Giannis is incredible, and the decision on Jabari could go a long way toward shaping a Bucks team that will be a fixture in the East for the next four years. 5. Who are the tankers? How much longer do we have before teams like Orlando, Charlotte, Phoenix, and Dallas embrace the inevitable and go into full–blown tank mode? Can Memphis tank without alienating Marc Gasol? Should the Grizzlies even be worried about Gasol at this point? 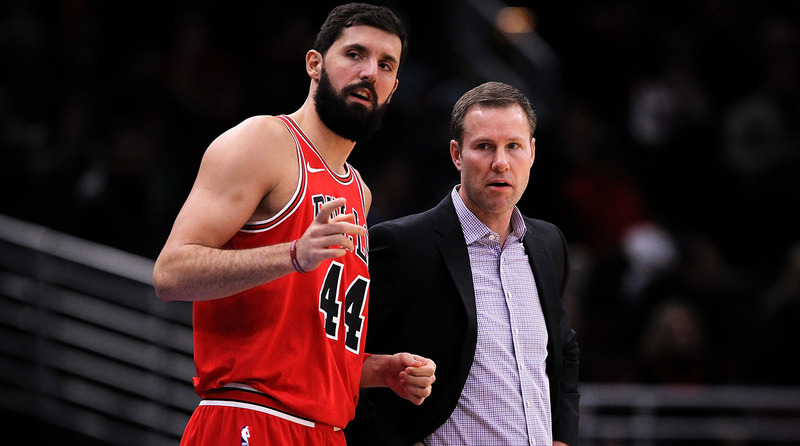 And what about the Bulls—are they tanking or riding Mirotic to a No. 8 seed? How many losses will the Knicks endure before everyone in New York stops worrying about the playoffs and starts worrying about Doncic? This season marks the final year of traditional tanking before lottery reform takes hold next season, and as Trae Young and Marvin Bagley take turns destroying college basketball teams, the 10 worst teams in the NBA are separated by all of 3.5 games. Find your tanks and STRAP IN. 6. Is Draymond Green 100%? This is a tough one; most of Draymond's physical ailments have been fairly minor, and we're all basically guessing about his health. He missed some time last month with a sore shoulder, he's missing a game this week with a sprained ankle. None of this is a crisis, and concern about any of it could definitely look ridiculous in a few months. But Draymond hasn't looked very sharp when he's played this season. He's been more erratic than usual on offense, he's had a handful of truly awful games, and watching him struggle to find his rhythm and struggle to stay healthy has been a very quiet reminder that the Warriors are not necessarily going to be unbeatable forever. Golden State can obviously win without Green—the Warriors have the best record in the league—but he's been the heartbeat of that team and the linchpin of that defense for almost four years. If his game slips either this spring or beyond, maybe the door opens just a crack for everyone else. 7. Will free agency make sense again? For the better part of the past four years, NBA free agency has been out of control. The cap spike was so dramatic that the entire system was skewed. It drove up the market for players like Joakim Noah ($72 million), Evan Turner ($70 million), Kent Bazemore ($70 million), Ian Manhimi ($64 million), and other legendary cautionary tales from the summer of 2016. Belts began to tighten last summer. First, the cap came in lower than expected, and then players like Kentavious Caldwell-Pope, Nerlens Noel, George Hill, and others hit the market only to find that massive long-term offers weren't there. It looked like the market had corrected itself. Of course, the flipside of that story is that it was a down year for free agents all over the league, and it's easy to walk away from Kentavious Caldwell-Pope and a $100 million asking price. This summer the choices will be more tempting, and we'll see how much has really changed. Talented role players like DeAndre Jordan and Avery Bradley would've been a lock to field a massive offer two years ago—when the entire league had cap space—but I wonder whether that market will be there in July. Likewise, restricted free agents like Jabari Parker, Zach LaVine, Marcus Smart, and Clint Capela all would've fielded lucrative offer sheets two years ago, leveraging those offers into a massive deal with their incumbent teams. But maybe that's not how it works anymore. Capela has been fantastic in Houston, for instance, but is there any team that's going to pay him $100 million? Randle has been miscast for most of his time in LA and could theoretically break out elsewhere, but how much will a team pay to see whether that theory holds up? There just isn't enough cap space around the league. And for the first summer in forever, we may find that solid, up-and-coming players all over the league are paid like starters, not superstars. 8. 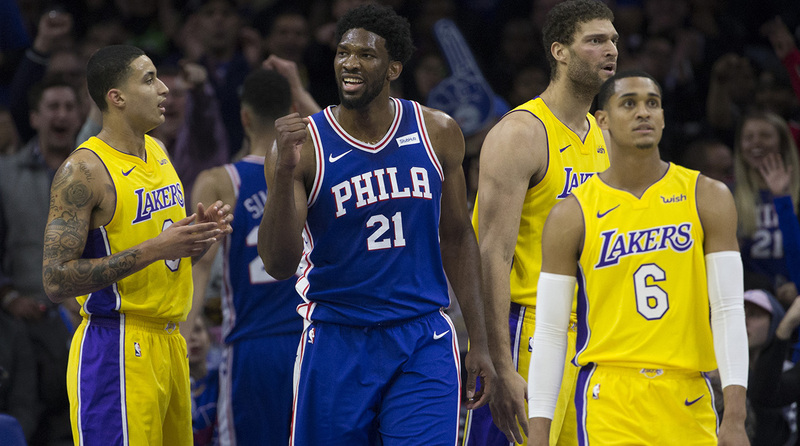 Brighter future: the Sixers or the Lakers? "Would you rather have the next five years of Philly or LA?" is probably my favorite NBA argument for the next year, in no small part because both fan bases would accost you and tell you the answer is obvious. It's a tough call, though. There are red flags on both sides. Include Embiid's injuries (and the likelihood that they never really go away), jumpshot allergies for Simmons and Fultz, and Bryan Colangelo's broader inability to improve the roster beyond using the pieces that Hinkie left him. But also include Lonzo's own jumper struggles and limited ceiling as a superstar, Chekhov's LaVar Ball lurking behind the scenes, a largely unproven roster with questionable trade value, a still mostly-unproven coach, and the very real possibility that the Lakers have spent the past eight months getting played by LeBron. And yet: Philly, when everything clicks, is the scariest young team in the league. If Embiid stays healthy he'll be one of the five best players in the league, and if Simmons gets even half of a jumpshot he'll be close to unstoppable by the time he's 23 years old. If Fultz reclaims his jumper, they have the pieces in place to own the East through the next decade. For the Lakers, Brandon Ingram has all the makings of an excellent second superstar, and as far fetched as LeBron and Paul George rumors seem, L.A. is not going to strike out on big names forever. There is real talent on hand now—Lonzo's getting better as the year unfolds—and it won't be very much longer before the combination of weather, fame, and cap space render everyone's Lakers jokes obsolete. But then, even if it works in LA, would that be enough to trump a decade of Simmons, Embiid, and Fultz? Or should "decade of Simmons, Embiid, and Fultz" come with several giant asterisks until further notice? We can have this argument for the next seven months and there will be absolutely resolution. That's why it's great. 9. Where is LeBron going in July? This is the biggest question of 2018. It's so obvious, and the decision will be so thoroughly dissected (on this very website!) that we don't need to dwell on it today. But it had to be mentioned, if only so I could include grainy footage of that old Nike commercial that has been (apparently?) scrubbed from the internet. 10. Will this year's draft be even better than last year's draft? On Saturday, I blocked off my afternoon to watch Trae Young. This was a good decision. He dominated TCU with 39 points and 14 assists, and even at just 6'1, he looks like the most unstoppable player in college basketball. Later that day, Marvin Bagley had 32 points and 21 rebounds for Duke. Then, Saturday night, DeAndre Ayton had 23 points, 19 rebounds, and 3 blocks to beat No. 3 Arizona State. Finally, on Sunday morning, Luka Doncic put up 24 points, eight rebounds, and five assists in 22 minutes during a pro game in Spain.